I wanted to share with you all my lunch for today! 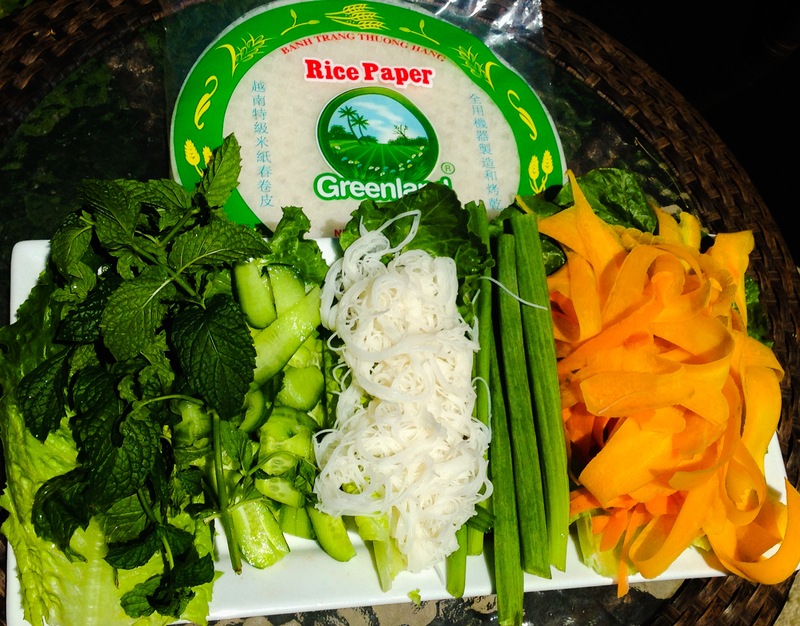 Very simple & healthy Rice paper Salad Rolls with my Sweet and Sour Mint sauce 🙂 I have this meal every time I go to a Thai restaurant… usually it is served with a peanut sauce which I can not have!! ( allergic to peanuts) and of course peanuts are higher in fat and not HCLF! I had some rice paper and decided to make these today!!! and it was SO DELICIOUS!!! prep and cut all the veggies to your liking. Cook half a bag of rice noodle, drain and splash with cold water. place the veggies in the center vertically in no particular order. Tuck the Upper and lower sides of the paper first and then roll over once and roll the veggies till they are all tucked in. there you go! you have your sauce ! sweet healthy and fat free! as always , YOU’RE WELCOME! Next Top 5 Vegan & Cruelty-free Must haves!! Drool. These look delicious! And I never know which rice papers to buy, so thanks for showing a good brand! they look totally yummy…..thanks for sharing…. OOOH snap, this look so good. I’ve never been brave enough to try making these. They always look so sophisticated, and complicated, but you laid it out so simple. I guess this goes to show that less is more sometimes, and raw is best most times. Now I just need to find some rice paper here in Spain. mmmmm. thank you 🙂 I got mine from the health food store, but if you have an asian market around you, they will definitely have it 😀 hope you find some and enjoy! haha! you’re welcome 🙂 enjoy! this looks so good for a hot summer day. 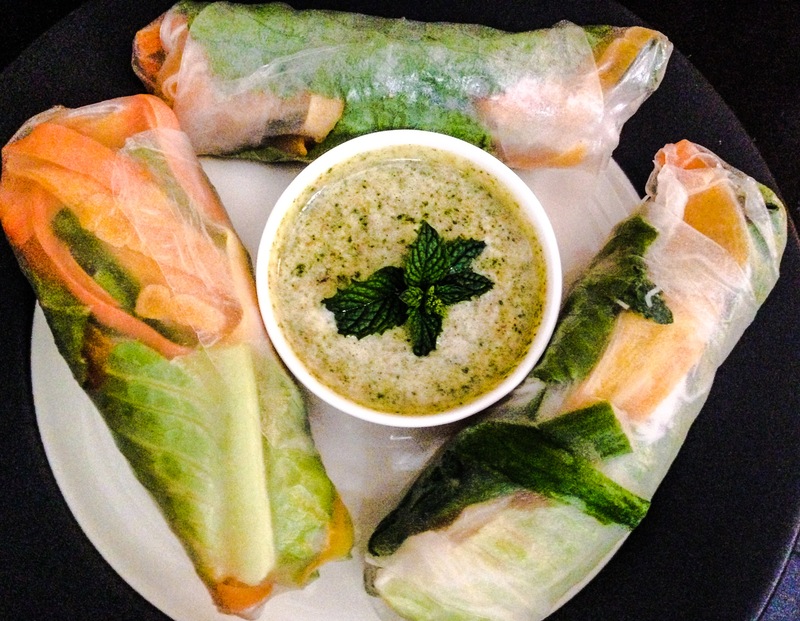 I usually make them with a peanut sauce, but I definitely want to try the mint one you posted! Oh these look fab, I wish I was wrong these instead now. Thanks for sharing. Love these! I make a version of these all the time too. I will have to try out the sauce because that looks to yummy! its super yummy 🙂 enjoy! Those look great! I love making Summer Rolls, there are so fresh! I will have to try out your sauce that you made. I usually use a little hoisin for mine.